Personalize this men's 100% Turkish cotton terry bathrobe. An embroidered robe is a unique gift perfect for almost every occasion. 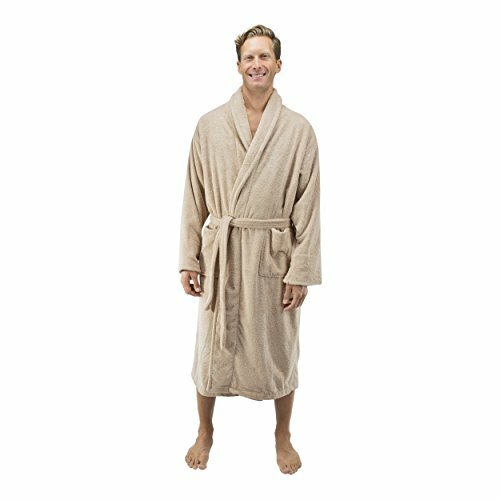 This bathrobe is made from a luxurious 16 oz. per sq. yard/543 GSM cotton. It has a shawl collar style fashioned from the finest Turkish terry cloth. Generously cut for extra room and comfort, this thick terry cloth robe is super absorbent and will only get softer and more absorbent with each wash. It perfect after the hot tub, shower, sauna, or as a quick wrap in the morning or evening on a cold night! This men's robe is considerably heavier than most robes and weighs in at 16 oz. per sq. yard/543 GSM, making it weigh anywhere from 4.5 lbs. to 5.5 lbs. CARE: This robe is machine-washable. To care for this robe, wash it separately in cold water on gentle cycle and use no bleach. After tumble-dry on low heat. Avoid fabric softeners - they contain silicon that will make robe water repellent. To soften the bathrobe, use 1 cup of white vinegar about every 6 weeks. FULFILLMENT LATENCY: Please allow 2-4 days for our embroidery team to complete your order. RETURNS: Sorry, there are no returns on embroidered, personalized, used, or discontinued items. If you have any questions about this product by Comfy Robes, contact us by completing and submitting the form below. If you are looking for a specif part number, please include it with your message.